Amorah Quan Yin's latest collection of channeled teachings on the nature of spiritual initiation, mystery schools, and how to access energies for personal transformation. • By the author of The Pleiadian Workbook (40,000 copies sold). • More than 25 recorded transmissions from Ascended Masters, St. Germain, Elohim, Mother Mary, and many others. • Includes guided meditations and exercises for everyday life. Learn how to live in divine flow, deepen your spiritual connection to the divine source, and access spiritual guidance in becoming a true Master Being of Light. In her latest series of channeled transmissions, Amorah Quan Yin provides a fascinating chronicle of human spiritual evolution from a galactic perspective. Quan Yin teaches that there is infinite loving assistance available to humanity from the higher dimensions. 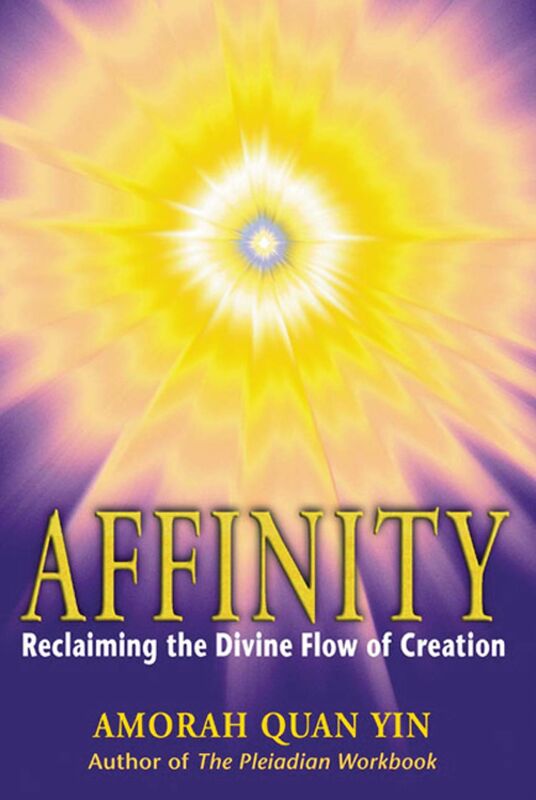 In Affinity she transmits the wisdom of the Ascended Masters, Angels, and others to assist us in learning how to receive this help and attain personal transformation. Drawing on the wisdom of Goddess Antares and the gentle support of the Dolphin Star Temple Higher Council, Quan Yin explains how to retune our bodies, minds, emotions, and spirits to the divine flow of the universe. Mother Mary teaches us how to remove ourselves from negative astral planes. From Elohim we learn how to work with our cellular structure on a spiritual plane. This extensive collection of teachings offers specific exercises and techniques to align us with our divine selves. Dear ones, when you seek grace, grace for lifting pain, grace for ease in your path, it is important that you know that all the divine qualities work in pairs. You commonly refer to certain angels, myself, and other Elohim as those who embody and work with the frequency of Divine Grace. Yet grace and mercy are divine counterparts that are inseparable. For even with qualities such as Divine Love and Divine Innocence there are feminine, more receptive aspects of the qualities, and there are the more masculine, generative aspects, as well. Grace requires you to be in your feminine and receptive side. Whereas mercy is a quality, that once you begin your spiritual path, you must bestow upon yourselves in order to receive grace. Let me explain. To be merciful with one's self begins with ceasing the most obvious forms of self-punishment, and any kind of self-harm, or harm to others as well. Yet there are subtler forms of mercy that we wish you to be aware of so you can work with us more fully. There are situations in which your ability to be merciful is directly correspondent to our ability to dispense grace; because to dispense grace when you are not doing your part can sometimes override your learning. To be more receptive to grace, and the ease that it brings into your life, it is important for you to understand the meaning of living in mercy with yourself and others. If you are aware that you have a pattern that was created for self-protection-to keep you isolated from harm in any way-mercy requires that you, as an adult, not judge yourself for having created the pattern in the first place. Mercy also requires, that when you realize the pattern is holding you in ego separation in present time, that you cease to give it your power. In other words, when you find yourself in any thought, behavioral, or attitudinal pattern, which creates the illusion of separation between yourself and others, between yourself and us, then your part of this formula of grace and mercy is to cease the pattern in a merciful way with yourself. Many of you approach it from an aggressive stance that is lacking in mercy for yourself. You have attitudes towards yourself or others such as, "Damn it, there I go again," or "What a stupid thing I am doing." You criticize yourselves in a merciless way. And when you are attempting to change your patterns in that manner you limit yourself not only in effectiveness without yourself, but you severely limit the amount of help we are able to give. Why? Because the frequency of your critical attitude is such that it does not allow you to be receptive. It limits your sense of your deservingness and availability for grace and healing. Certainly this self-negating pattern can be subtler than the grosser displays of low self-worth that you have experienced at times in your life. Still, we believe it is important that you know this. It will assist you in recognizing when you are in the critical attitudes that you may have taken for granted in the past. Perhaps it will also assist you in understanding that there are times when you have felt that your path is more difficult than it should be. When you recognize that your own effort is what is causing the problem, you can become more merciful with yourself, and experience more grace and ease. It is your over-effort to try to be better than you perceive yourself as being that holds you back and takes a lot of the fun out of the process of becoming what you truly are. Using the attitude of mercy means that when these patterns arise, and you become aware of them, you simply say to yourself, "Ah, there's that ego separation pattern that was at one time needed, but is no longer appropriate. I choose to shift it now." Let it be that simple. Use your spiritual tools for clearing the old beliefs, ore see a healer, if needed. But do it out of self-love, because you deserve the freedom it will bring. Every time you criticize yourself, or are harsh with yourself about "doing the same thing again," it is as if you have taken that injured child, shaken it by the shoulders, or even hit it, and put in more trauma on top of the original. Certainly, catching yourselves is better than being oblivious. But it is time to refine the manner in which you respond when you catch yourself. Do you honestly think that your inner, injured child is going to take the hand of the one who is scowling about the problem? As you learn to respond in Divine Truth, as you change and grow, you can extend a friendly hand to the part of yourself that is experiencing illusion. As you send love, as you look at that part of yourself in a loving way, and you extend a friendly hand, Divine Mercy steps in and takes charge. Then the injured part of you can trust you, take your hand, and lift out of the old pain and separation into grace. Amorah Quan Yin (1950-2013) was a natural healer and psychic since birth, and as a child was gifted with clairvoyance and clairaudience. A personal health crisis in later years led her to a path of holistic living, spiritual awakening, and sharing her gifts with others. Amorah was well known and respected as a healer, seer, and teacher based in her beloved Mt. Shasta, California. ". . . thought-provoking, astute, and utilizable."